HXY. 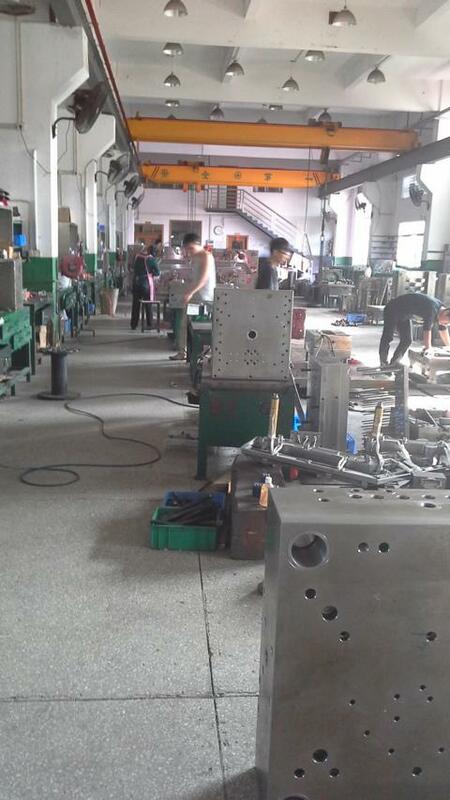 is a long-established Plastic Mold Manufacturer that started as a manufacturer of radial drilling machines in 1947. In the succeeding decades, the company developed a leading role in the manufacture of high-speed and high-accuracy milling and boring machines. Now, the Mecof Group has a personnel roster of approximately 500 spread throughout Europe and the United States. Sales and services offices are located in Germany, France, Russia, and the United States. The headquarters operation, Mecof S.p.a is responsible for the design, manufacture, assembly, sales and service. Salvadeo Srl handles the assembly of the Unica line and retrofitting activity while Spaziosystem Srl is the software house. There are as well two general engineering workshop organizations, Meccanica UNO Srl and Mecof Hungary Kft. A newly developed production range draws on the power of HSC. The high accuracy of the Mecof machines offer a decrease in machining time from 40% to 70% for molds and dies, and reduced time for finishing. To excel in today’s competitive plastics arena, plastics manufacturers are striving to provide their customers with the best possible products and service. Increasingly, this group of manufacturers is specializing in one aspect of the product development process—in design, for example, or in engineering, tooling, or production. Such is the logic that has propelled two medium-size companies, Günther Hot Runner Systems Inc. and Weigelt Systems, to join forces. Each is managed by its owners and each concentrates in different fields of the product development process—Günther in hot runner systems, Weigelt in liquid silicone. By entering into this partnership, Günther hopes to cater to all the needs its customers might have. As part of a campaign to promote its high-performance milling products during September’s International Manufacturing Technology Show (IMTS) in Chicago, Kennametalconducted a sweepstakes with a “Speed Machine” hot rod as the grand prize. The car was a custom-built 1934 Ford coupe in Kennametal yellow with a 350-in³, 350-hp Chevy engine. The winner was Gord Brock of Roctel Linamar in Guelph, Ontario, Canada. UK machine tool distributor Warwick Machine Tools Ltd. (WMT), founded in 1970 and acquired by Yuasa Trading of Tokyo in 1992 to form Yuasa Warwick Machinery, has been reestablished under the old name as sole UK agent for ONA EDM equipment and a new range of bed-type machining centres from MTE. Both ONA and MTE are based in northern Spain. ONA is the biggest producer of large-scale EDM machines in the European Union and the oldest EDM equipment manufacturer in the world. WMT is a joint venture of Yuasa Trading and Gerard Berger, who was responsible for ONA sales at Yuasa before becoming managing director of the new company. Paul Barry continues as technical director. All warranties on ONA equipment installed in the United Kingdom will be honoured by WMT. Says Berger: “In reestablishing WMT as essentially a single-product supplier of ONA equipment, albeit we now also have a complementary range of prismatic metal-cutting machines, it is my intention to give ONA customers the support they deserve but that was perhaps diluted when the products were sold through a multi-machine-tool distributor.” Technical sales are handled both in-house and through distributors, with an emphasis on collaborating with the customer to satisfy particular needs. The company recently unveiled a new range of high-end ONA die-sinkers and fixed-bed submersible wire-cut machines as well as entry-level wire-cut machines based on the Prima family. The 2,200 companies who participated in the 23rd BI-MU/SFORTEC exhibition, held Oct. 3-9 in Milan, have pronounced the event a success. Sponsored by UCIMU-Sistemi per Produrre for manufacturers around the world, the exhibition showcased machine tools, robots, automation and ancillary products — NC, tools, components, accessories — as well as a wide range of subcontracting products. BI-MU alternates with EMO, which is held in odd-numbered years. Companies participating in the trade fair, which included about 1,000 foreign firms, showcased their products in seventeen halls in the Milan Trade Fair District, occupying an area of 97,000 m². A total of 121,590 people visited the exhibition, a figure in line with the record number of visitors recorded for the 2000 event. Italian visitors numbered 114,924. The event also attracted 6,666 foreign visitors from five continents. Dignitaries present at the opening ceremony, presided over by UCIMU-Sistemi per Produrre president Andrea Riello, included Luigi Roth, president of the Milan Trade Fair Foundation; Massimo Zanello, Lombardy alderman for industry, small and medium-sized companies, cooperation and tourism; Alberto Bombassei, president of Federmeccanica, the mechanical engineering employers association; and Alfredo Mariotti, director general of the association.